Which British Cereal Are You? When your alarm goes off, do you...? Shake your fist at the world for ruining everything. Try and wipe out all emotion and get ready in a zen-like state. Wake up with a smile and get ready for the day ahead. You see a ride-on lawnmower that's been left unattended with keys in the ignition. Do you...? Try and locate the owner to let them know they've left the keys in. Take it for a quick 2 minute spin. You're basically just helping mow the lawn. Immediately WhatsApp a braver friend to come and take it for a ride. Find a nearby squirrel to chase. It's fun, safe, and legal. My name's Karen. Would you like to be friends? Where would you most like to live in Britain? On a barge that the postal service find inaccessible. What's your favourite place for a day out? At what point would you use one of those aeroplane wee bags that velcro to your leg so you don't need to get up to go to the toilet on a flight? I don't need any persuading to use such a great product. If I were paid to use one and make a #spon video about it. Under no circumstances would that happen. You find yourself in 1689 in Bristol. What do you do? Hide in a barrel of some description. Pretend you're a parrot so that a sailor will look after you and keep you on their shoulder. Write some sea shanties in the hope of becoming an olden days celebrity. "Weetos! Weetos! Weetos! Weetos! Weetos!". That's what people shout when you turn up at a party. Except they probably use your name instead of "Weetos". You're fun, people like you, and things only get better when you're left to go soggy in a bowl of milk for 3-4 minutes. You're a staple, reliable, lovely classic of a human. If people came down for a hotel breakfast and you weren't lying on the buffet table, they'd be like "Something's up!" People love you for your familiarity, dry sense of humour, and the fact you work well with many fruit, jam, yoghurt and compote toppings. Wow. No Added Sugar Alpen. You're a human that likes to be taken seriously. Even your sister - Alpen WITH Added Sugar - you consider to be a bit OTT and silly. That said you've got lots of fascinating bits to your personality (inc raisins, oats, seeds) so you're always great to chat to at a party and a good source of slow-release energy. WHAT ARE YOU DOING HERE?! This is a CEREAL quiz. You must have pressed some very strange answers indeed. We love you for this of course! Now don't get upset about being a cornflake. True, it isn't the most exciting thing in the whole world, but it is a PIONEER. You're the first. You're original. You carved the path for others. Without your pioneering attitude there could be no Frosties, no Crunchy Nut, and none of the other flaked cereals which exist. Plus, if we covered you in melted chocolate and put you in a fridge for 3-4 hours you'd make a lovely dessert. You've got class. You're like Frosties if they bought a personal stylist and flew BA over Easyjet. That said, you pressed some pretty peculiar answers to get here. Which makes us think you must be a little bit peculiar. Peculiar can only be a good thing though, right? You're also quite sweet and fun. But be careful not to climb into the mouths of other people without asking permission - some people have allergies! You wake up. Laugh in the face of Rice Krispies for their dull demeanor and, after you've spent 2 hours rolling around in granulated sugar, are ready to go out and make people smile. Even though you're a joyous person, you do cause your friends increased dental bills which they will put up with so long as you keep bringing them happiness. Simple. Dry. Sensible. All words that work when describing Shredded Wheat. And you. That's not as bad as it sounds either. You're simple like a well designed cabinet. You're dry like Louis CK. And your sensible nature means you won't fall down any wells or ravines at HUGE cost to the government and local services. Also, if you blend yourself for 13 minutes then you turn to a dust that's great for adding texture in recipes! 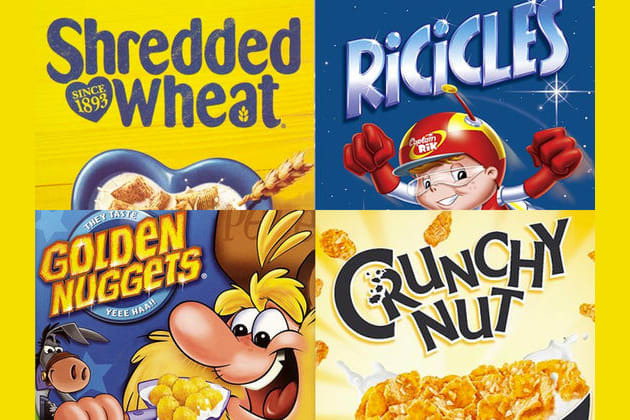 Answer these questions to see which British cereal you're most like.